Many in Ethiopia are reeling from the news that several Ethiopians were killed in Libya by the Islamic State group, which over the weekend released a video purporting to show the killings. The killings, which have shocked many in the predominantly Christian country, were condemned by Pope Francis and U.N. Secretary General Ban Ki-moon. Pope Francis on Monday sent a letter to the patriarch of Ethiopian Tewahedo Orthodox Church, Abuna Matthias, expressing “distress and sadness” at the “further shocking violence perpetrated against innocent Christians in Libya. U.N. Secretary-General Ban Ki-moon condemned the killings and “utterly deplores the targeting of people on the basis of their religious affiliation,” his spokesman said. Some people gathered Monday gathered in an Addis Ababa slum to mourn two former residents whose faces were recognized in the Islamic State video. 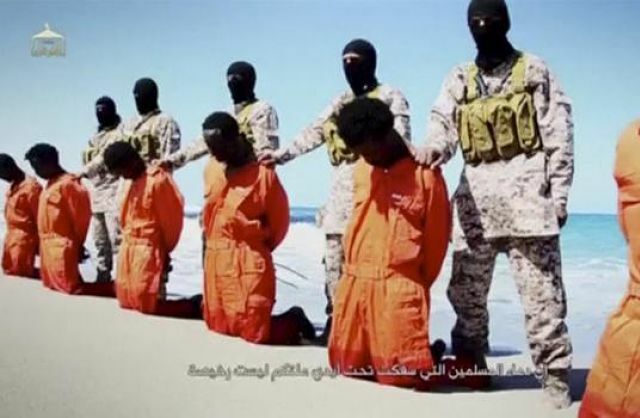 The 29-minute video, released on Sunday via social media accounts and websites used by the extremists, shows many Ethiopian Christians held captive in Libya being shot or beheaded by militants. Ethiopia’s three days of mourning start Tuesday, when lawmakers will meet to discuss the killings and consider the country’s possible response, the government said in a statement. Ethiopia has angered Islamic extremists over its military’s attacks on neighboring Somalia, whose population is almost entirely Muslim. A militant in the video said “Muslim blood that was shed under the hands of your religion is not cheap,” but the video did not specifically mention the Ethiopian government’s actions. The Islamic State video showing the killing of the Ethiopians starts with what it called a history of Christian-Muslim relations, followed by scenes of militants destroying churches, graves and icons. A masked fighter brandishing a pistol delivers a long statement, saying Christians must convert to Islam or pay a special tax prescribed by the Quran. Edith M. Lederer at the United Nations and Colleen Barry in Milan contributed.